We’ve received word that our Independence Day Parade in Milford, Michigan will be broadcast live by Channel 2, the Fox network. How exciting. 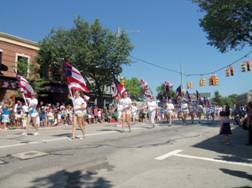 The local stations pick a parade to cover every year, usually in bigger cities or towns, but this year Milford’s parade will get its chance to shine. The Independence Day Parade down Main Street in Milford is about an pure a dose of Americana as one can get. There are lots of Brownie and Cub Scout troops, a few of the local dance studios, local church groups and civic groups from all over the area in the parade. This year there’ll be lots of politicians too, since it’s a big election year. The kids like the candy that parade participants pass out and the Huron Valley State Bank always gives out ice cream bars, which everyone likes. There’s always a band or two, although it’s sometimes tough to get bands to march once school is out. And at the end there are the big, noisy fire engines with sirens blasting. The kids love that, too. The parade steps off from in front of the Milford Museum at 11 AM. The Milford Historical Society organizes the parade every year with help from a crew of volunteers. You’ll notice them this year in their BRIGHT orange shirts emblazoned with “PARADE STAFF” front and rear. The first 2-3 vehicles in the parade represent the Milford Historical Society, including a tractor from historic Crawford Farm south of town. The Presenting Sponsor – Feldman Automotive Group will have the next two slots. The other major automotive dealers in the area who helped sponsor the parade are Hines Park Ford and LaFontaine and they will have new car models in the parade. Look also for the Digital Document Store vehicle and for the entry from The Milford Laundry and Horse Blanket Headquarters. Maybe you know someone who always wanted to come to the parade but just can’t. Let them know that they should be able to see it on Channel 2 live as it is happening. I’ll see you all on Wednesday.